I really like that this was easy to make, although you want to make sure the cake batter is spread evenly in the sheet pan as possible to avoid too much variation in layer height. The rosemary and orange in the pastry cream really added a nice little zing and worked well with the chocolate glaze! For the Yellow Cake: Preheat oven to 350 degrees F. Grease an 18”x 13” rimmed baking sheet, line it with parchment paper, and then grease the parchment paper too. In a large measuring cup, combine eggs and vanilla with 2 tablespoons buttermilk. In a large mixing bowl, combine sifted flour, sugar, baking powder and salt. Whisk well to combine. With the mixer on medium low, beat in the butter, canola oil and the remaining buttermilk into the dry mixture. Stir in the egg mixture in three parts, while scraping down the sides of the mixing bowl. Do not over mix. Fold in the whipped cream into the batter. Transfer batter onto baking sheet. Use an offset spatula to smooth surface and ensure the batter is an even depth. Bake for about 15 minutes, rotating half-way through baking, until the center is firm when touched. Allow cake to cool for 5 minutes in pan set on a wire rack. Flip the cake onto a wire rack then immediately re-flip back onto a second wire rack. The cake should be resting with the parchment side down. Allow the cake to cool for another 30 minutes. For the Rosemary Orange Pastry Cream: In a stainless steel pot, steam milk and cream with rosemary and orange peel. Combine sugar, cornstarch and salt in bowl. Pour hot cream over and whisk to combine. Return milk mixture to pot and bring to a low boil, continuing to whisk. In another bowl, whisk eggs and temper 1/2 cup of hot milk mixture into the eggs. Gradually pour this back into the pot and continue to whisk as the mixture comes to a boil. Continue to cook until thick. Strain through a fine mesh strainer into a clean bowl with pats of butter in the bottom. Stir until butter melts. Chill with plastic wrap directly on top of pudding. Put cooled cake on a cutting board and cut into equal halves cross-wise. Cut length-wise so that you have 4 equal pieces, measuring about 6″x8″ each. Cut out a 6″x8″ rectangle out of stiff cardboard. Put the first of the cake piece on the cardboard. Use a spatula to spread 2/3-cup of pastry cream over layer. Repeat with two more layers. For the Dark Chocolate Glaze with Orange Liqueur: Put the chocolate and butter into a heat proof bowl. Heat heavy cream and triple sec until just hot. Pour hot cream over chocolate and stir until smooth. Let cool slightly before pour over cake. Putting it all together: Layer cake, pastry cream, cake, pastry cream and third cake. 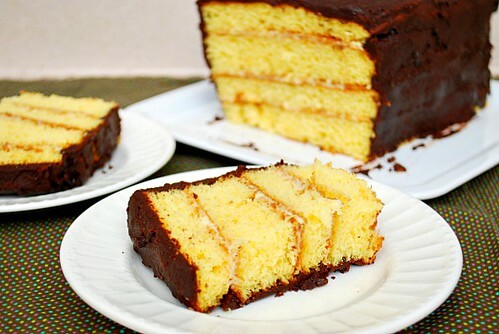 Drizzle chocolate glaze over top of cake and spread to cover the sides of the cake completely. I'm ready for spring - all the fresh produce!